The 21st annual 2K Classic benefiting Wounded Warrior Project began with a pair of resounding wins on Friday evening. In Durham, Grayson Allen scored 26 points as No. 5/4 Duke began defense of its national title with a 92-74 win over Siena. Allen was 8-of-13 from the field, including 2-of-5 from three, and 8-of-8 from the line to lead the Blue Devils. Duke also received 19 points and 12 rebounds from Amile Jefferson, 15 points from Brandon Ingram, and 10 points from Matt Jones. Marquis Wright scored a team-best 20 points for Siena, while Lavon Long and Javion Ogunyemi each had 15 points. In Richmond, VCU used its Havoc to score 33 points off 22 turnovers in capturing a 75-50 win over Prairie View, giving head coach Will Wade his first win as the Rams’ mentor. The game also marked a school record 67th consecutive home sell-out for VCU. Melvin Johnson and Doug Brooks scored 13 points apiece to pace VCU. Justin Tillman netted 10 points and pulled down a game-best 11 rebounds. JeQuan Lewis handed out seven assists to go with eight points. Mo Alie-Cox had eight points, nine rebounds, and four blocked shots. Prairie View received team highs of 13 points and eight rebounds from Zachary Hamilton with Karin York adding 12 points and seven rebounds. The 2K Classic benefiting Wounded Warrior Project continues on Saturday when Georgetown hosts Radford in a noon (ET) tip at the Verizon Center on FS2. 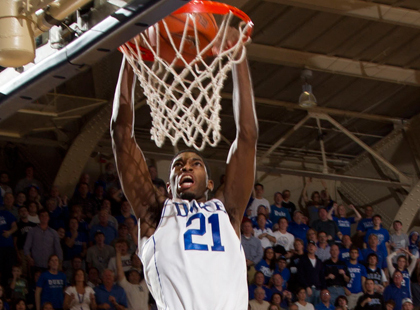 Later that day, Duke returns to action to face Bryant in an 8:00pm (ET) start on ESPN3.